I recently read online about a sociology experiment conducted during the 1960s. Scientists placed five monkeys in a cage, with a bunch of bananas hung from the ceiling and a ladder placed directly beneath. It took only a few seconds for one of the monkeys to race up the ladder to grab the bananas. The next day, whenever any of the monkeys started up the ladder, the researchers would spray all of them with cold water. Soon, each of the monkeys learned to not climb the ladder. And, if any of them started to climb, the others would hold them back by pulling on their tails. This was done repeatedly until each monkey had learned the lesson: Don’t climb the ladder. Once all five monkeys were conditioned to avoid the ladder, the researchers substituted in a new monkey. And, of course, when the “new guy” spotted the bananas and started up the ladder, the other four monkeys jumped in and prevented him from climbing. One by one the researchers replaced each monkey until none of the monkeys in the cage had been sprayed by the icy water. Yet none of these new monkeys would go up the ladder. The rules had been set. This may be true if all stampings were produced from plain-carbon steel less than 0.050 in. thick. When burr height begins to approach 0.003 in., they start to become noticeable. In some instances, burr height greater than 0.005 in. can become dangerous, with the potential to cut assembly workers or customers. This often-repeated “10-percent rule” can be found in 19th century metalforming publications, including J.L Lewis’ Dies and Die Making (Journal of Commerce, 1897). Would today’s stamping customer really accept a 0.012-in.-high burr on a 0.125-in.-thick stamping? This one never seems to die, no matter how often it is disproved. Forming-speed data found in many handbooks and literature likely are based on E.V. Crane’s 1931-vintage book, Plastic Working of Metals and Non-Metallic Materials in Presses. Crane’s data was based on galling criteria—conditions generally created by lubricants. Crane states, “As drawing conditions become more severe, a compounded oil including say 15-percent of lard oil and five percent of wool fat in a mineral-oil base is about as efficient as pure lard oil and much less expensive.” Are his maximum forming speeds really applicable today? Depending on the hardness and thickness of the material being cut, ideal clearance can vary from 5 to 20 percent per side. As a result, metalformers should avoid making broad statements regarding punch-to-die clearances. Fig. 1 easily debunks this over-generalized rule. 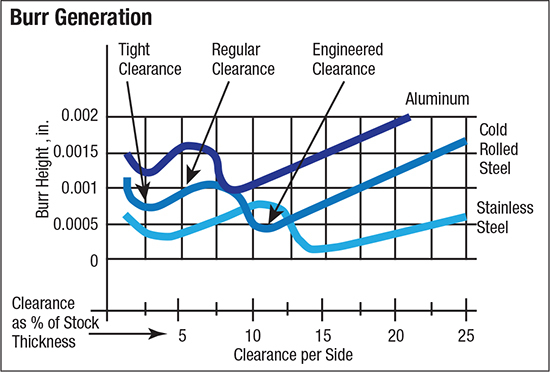 While a 10-percent cutting clearance per side may be ideal for cold-rolled steel, for stainless steel it leads to excessive burr height. It also is to large for aluminum stampings. Although very useful, Fig. 1 only provides guidelines based on the specific grade tested within the different material types. The ideal cutting clearance for aluminum, for example, depends on alloy type, temper and sheet thickness. 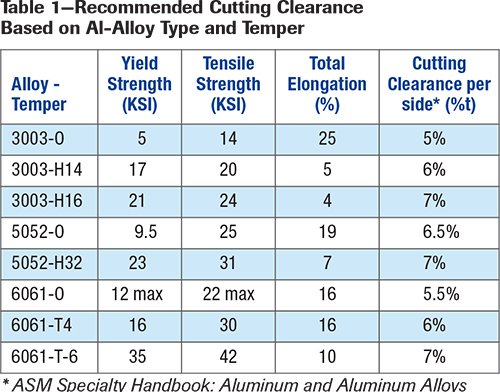 Table 1 provides suggested punch-to-die clearances, in terms of percent of sheet thickness (t), for three different grades and tempers of aluminum. Cutting clearance in a stamping die provides leverage to bend and break the slug free from the parent material. As material strength increases, so does the required amount of clearance, to provide additional leverage to break the slugs free from the stronger parent material. 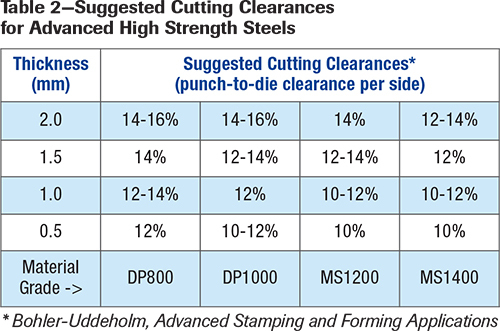 Thus, when stamping higher-strength steels, the required cutting clearances can be twice as great as those required for aluminum (Table 2).